So very slow, but never boring. Linklater seamlessly transitions from one year to the next for 12 straight years, giving us a peek into one family’s mutation, adaption and drama along the way. Ethan Hawke and Patricia Arquette lend their comfortable and familiar performances to help it along and seeing those two morph into who they are today is fascinating in itself. 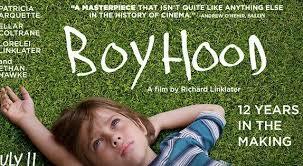 It’s not often that you one can say they’ve seen something completely new on screen, but once you’ve seen Boyhood you can. Posted on Thursday, August 7th, 2014 at 12:46 pm and is filed under Reviews.